Starlings are often described as a “marmite” bird you either “love them or hate them”. I’m very much the former and find them endlessly fascinating. Lately the profile of starlings has increased markedly with natural history programmes and even TV commercials using the allure of murmurations where thousands of starlings perform breath-taking pre-roost aerial displays. Alas, our often-maligned noisy avian neighbour, has suffered a severe and prolonged population decline since the 1980’s. Across the UK the starling population has declined by over 60% since 1995 (BTO Breeding Bird Survey Data). The exact causes of this decline have yet to be found. 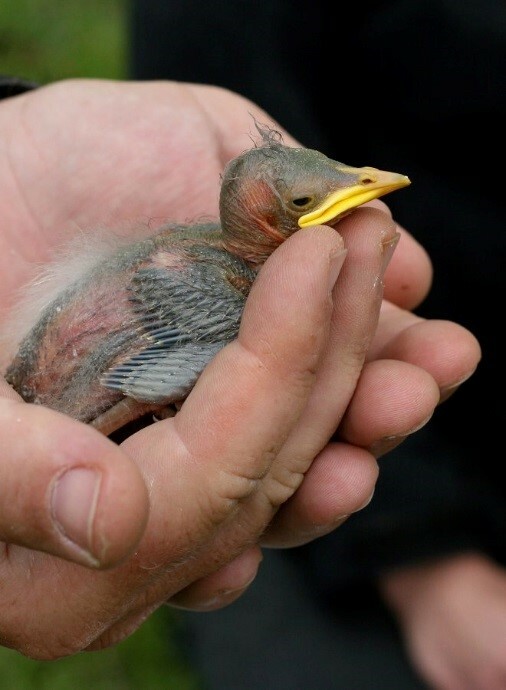 Research in Denmark found that declines in rural starling populations were most likely linked to changes in cattle grazing regimes and the effect this has on the availability of soil dwelling invertebrates such as leatherjackets and earthworms that are the main food for nestlings. In the East of England, the area of grassland grazed by cattle or sheep has declined over the past few decades. Indeed half a century ago the farm that was to become RSPB Hope Farm was once a mixed farm with cattle. Today though we have just under 4% of the farm (6.5 hectares) as grassland which is grazed by both sheep and horses. It is thought that these small pastoral pockets of land within a landscape dominated by arable farming may benefit insectivorous birds such as the starling, in the way that small pockets of arable land in areas dominated by grassland have been shown to benefit granivorous species. When RSPB first bought Hope Farm there were a small number of starlings nesting in old trees around the farm. 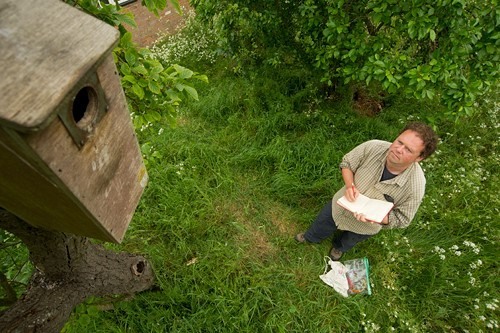 By 2002 a number of nest boxes had been put up around the orchard and farmyard to see if it would be possible to increase numbers. Uptake of these boxes was quite steady and the number of boxes around the whole farm was expanded to around 50 by 2005. These boxes are systematically monitored each year for nesting starlings to determine occupancy rates, breeding success and also to take growth rate measurements of nestlings. 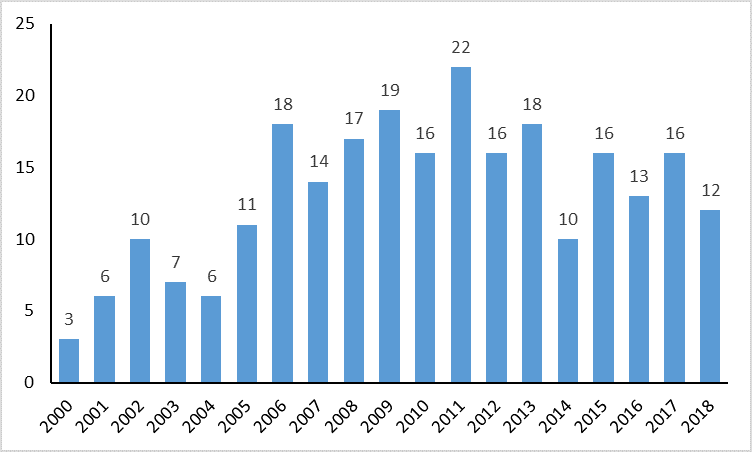 The bar chart below shows the number of starling territories the farm has held since 2000. 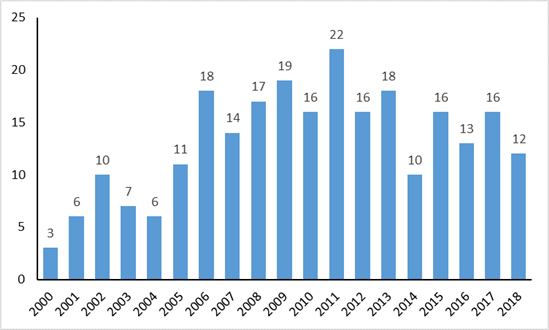 The higher number of territories from 2008-2013 coincide with increased densities of sheep grazing on our paddocks linked to experimental research trials. In the past five years we have averaged around 13 territories per year, 2018 fitting into this pattern with 12 territories. 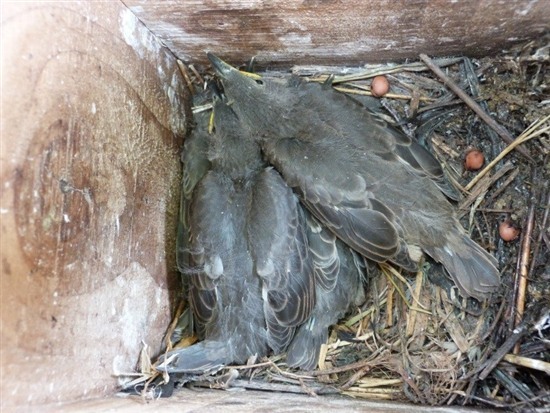 Each year we monitor the boxes from when the first eggs are laid until the last chicks fledge. The first eggs in 2018 were laid around 20th April over a week later than usual and two weeks later compared to some years. All the nestlings are ringed and biometrics (tarsus length and weight) are taken on two dates before fledging (usually between 5 and 14 days old) to determine growth rates. On average each year our nest boxes fledge 52 birds. It’s sad to report that after the first broods in 2018 only 28 nestlings had fledged successfully. We think that the very dry conditions over the past month may have made it difficult for adults to forage for soil dwelling invertebrate food. We hope that some second clutches will be laid over the next couple of weeks to potentially increase the numbers fledging this year. I’d personally like to thank volunteer Maureen Reeves for her hard work and help in monitoring these nests with me. Without her invaluable assistance we would not be able to collect such data.